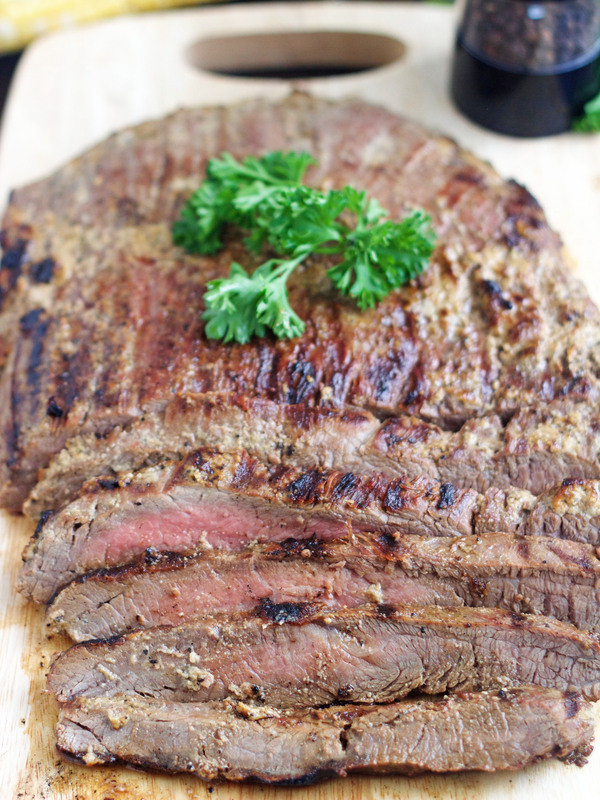 Tender, juicy and incredibly flavorful, this Grilled Marinated Flank Steak is amazing! It’s been a family favorite for years and we never, ever get tired of it. I posted this Grilled Marinated Flank Steak over six years ago so it’s been buried deep in my archives and many of you probably don’t even know it exists. It’s the best flank steak I’ve ever had and most definitely deserves a chance to shine again in the spotlight. Not to mention the fact it was desperately in need of new photos. It’s a recipe I got from my my mother-in-law when I got married. Over the years it’s been the thing my boys usually request when we go to grandma’s house for dinner. The flavor is absolutely amazing and it’s the juiciest, most tender steak. We love making sandwiches with any leftover meat and rolls. It’s also delicious thrown in a salad. Our favorite sides to serve with this steak is our favorite family rice (also in desperate need of new photos) or baked potatoes. But given the choice, my boys will choose the rice 9 times out of 10. It’s seriously so good with this steak. We’ve even been known to pull out grill our in the dead of winter so we can enjoy this steak. It’s seriously fabulous! Make sure you grill it on high heat. It’s a thin cut of meat and you want to sear the outside of the meat, without overcooking the inside, so make sure your grill is HOT before placing the meat on it. I usually keep my grill on high to get it really hot, then turn it down to about medium high heat after placing the steak on the grill. Make sure you let the steak rest after grilling it. Cover it with foil and let it sit about 5 to 10 minutes. This allows the juices to settle which makes the meat more tender and juicy. Make sure you cut across the grain. You will see directional lines in the meat, so make sure you slice perpendicular to them. If you cut along the grain then the meat will be tough and chewy. This marinade is also delicious for pork tenderloins. I grill them as well. Flavorful, tender and absolutely delicious, this flank steak will become a family favorite. Combine all marinade ingredients into a blender. Blend thoroughly. Pour over flank steak and cover. Marinade overnight (or up to 24 hours). Remove from fridge about 15 minutes before grilling. Heat grill to high heat. Once grill is hot, reduce heat slightly and place steaks on the grill. Cook 5-6 minutes on each side, depending on how well done you like your steak. Cover with foil and allow to sit for about 5 minutes before slicing. Cut the meat across the grain, at a diagonal, in thin slices. Flank steak is a pretty tender meat, but I like to use my meat tenderizer on it before pouring the marinade over it. I just "pound" over the steak a few times with my tenderizer. This not only makes the meat even more tender, but it lets the marinade really seep into the meat, making it even more flavorful. I usually buy two steaks that are about 2 1/2 each and marinate both of them. The marinade recipe is enough for both steaks. Yes, of course you can use this marinade for London broil, but I would definitely marinate it longer (2 full 24 hours). This is the only way to eat a flank steak!! This sounds so delicious – I can’t wait to try it …thanks for the recipe! Oh it’s the best! You’ll love it.